AlphaGo is a portrait of the moment in time where humans realise the infinite potential, and radical threat, emerging with the rise of AI. AlphaGo chronicles a journey from the back streets of Bordeaux, past the coding terminals of Google DeepMind, to Seoul, where a legendary Go master faces an AI challenger. As the drama unfolds, questions emerge: What can artificial intelligence reveal about a 3000-year-old game? What will it teach us about humanity, and what hope to humans have against the immanent rise of AI? With more board configurations than there are atoms in the universe, the ancient Chinese game of Go has long been considered a grand challenge for artificial intelligence. On 9th of March, 2016, the worlds of Go and artificial intelligence collided in South Korea. The best-of-five-game competition, coined The DeepMind Challenge Match, pitted a legendary Go master against an AI program that was still learning to play the world’s most complex board game. 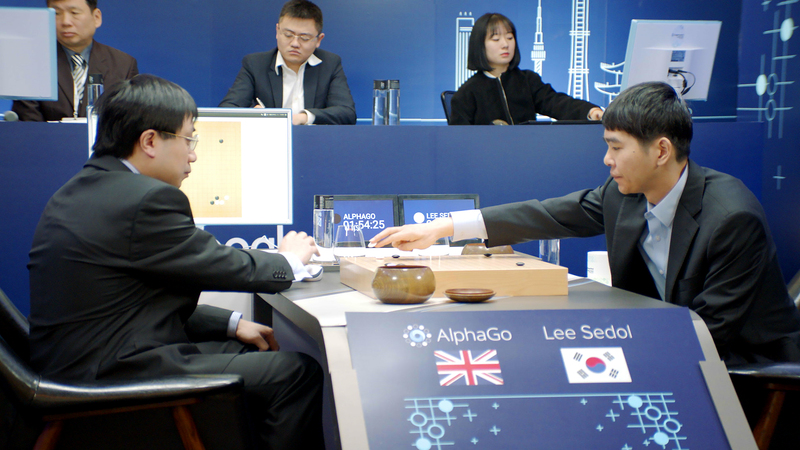 AlphaGo chronicles a journey from the backstreets of Bordeaux, past the coding terminals of Google DeepMind in London, and, ultimately, to the seven-day tournament in Seoul. The drama unfolds like a traditional sports documentary, only this time, the battle is between man and machine.